Centuries ago, an earlier version of cudighi existed as some form of Italian sausage. Today, residents of Italy are unfamiliar with the name and product. But Yoopers—locals on Michigan’s Upper Peninsula—treat this meat as uniquely their own. Around the turn of the 20th century, Italians sought mining jobs along the southern edge of Lake Superior, in Marquette County. According to The Oxford Encyclopedia of Food and Drink in America, one immigrant’s sausage stand changed the culinary landscape. He set up shop between his family’s barbershop and a local watering hole in 1936, selling homemade sausage sandwiches dressed with chopped onions, ketchup, and mustard. He called the meat gudighi and kept the recipe’s spices under wraps. After World War II, his son opened an establishment that offered the same sausage on a sandwich reflective of American food trends—namely, pizza and burgers. 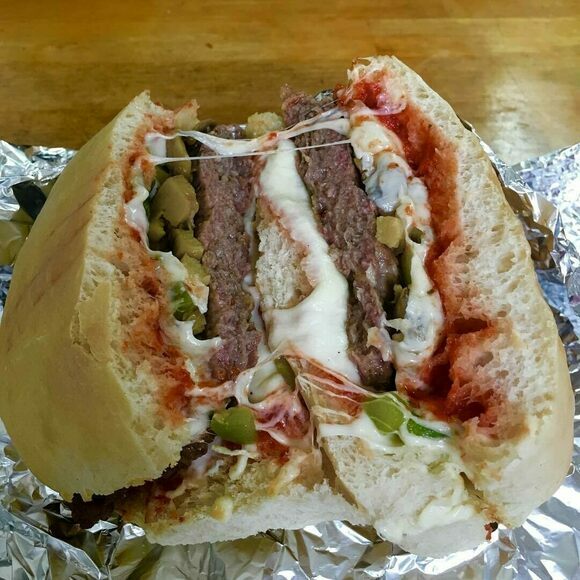 He flattened the sausage meat into a patty, fried it on a flat-top stove, and served it topped with pizza sauce (marinara) and mozzarella on a bread roll. Before long, competitors in the county towns of Ishpeming, Negaunee, and Marquette all took to what eventually came to be known as “cudighi” and began producing their own versions. Today, local pizza joints, pasty shops, delis, and restaurants still advertise the creation. Butchers and grocers make everything from turkey-based cudighi to packaged cudighi spice mixes. Families buy links and loose meat to use as a pizza topping, meatball base, or pasta sauce ingredient. No longer a secret, recipes for cudighi instruct home cooks to season ground pork shoulder with red wine, cinnamon, nutmeg, and cloves. Garlic, black pepper, allspice, and red pepper flakes round out the flavor, but no hint of fennel—the most popular Italian sausage additive—appears on the ingredient list. Some say the cudighi may come from Italy’s cotechino, a fresh sausage made of pork meat, rind, and fat. While Italians might not recognize this American update, there is reason to suspect that anyone unacquainted with the U.P.’s signature, hot sandwich will quickly warm up to it. This family-owned business has specialized in homemade cudighi on a homemade bun for more than 50 years.